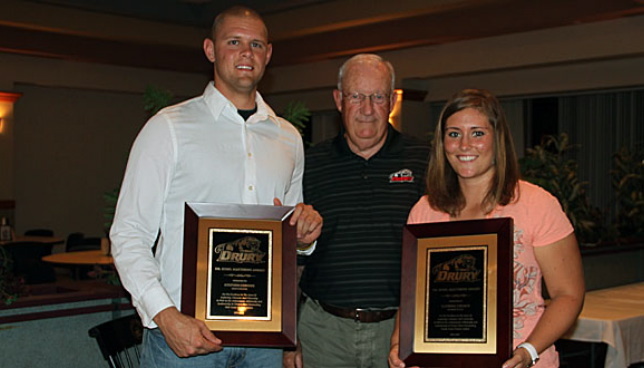 Soccer standout Stephen Conner and women’s golf standout Katrina Choate were named the recipients of the annual Dr. Edsel Matthews Award at Wednesday night’s “Panther Pride” Awards Banquet held at the Findlay Student Center. The two seniors picked up the prestigious honors for their athletic and academic excellence over the course of their careers. Conner was the record-setting goalkeeper who helped the Panthers reach the NCAA-II national quarterfinals as a sophomore and led DU into the finals of the Great Lakes Valley Championship last fall, while Choate is a two-time NCAA-II Championships qualifier (and perhaps, on her way to a third) who won the GLVC individual title last weekend. 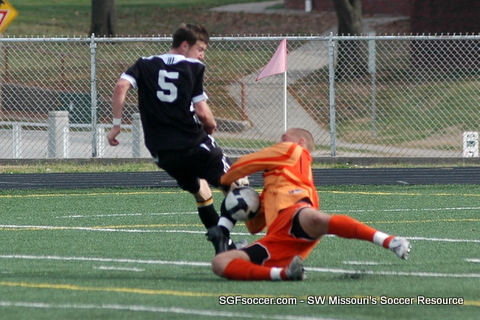 A set piece, sent into the box from 30 yards out by Caleb Collier (Kickapoo/Springfield SC), slipped through the hands of Panthers GK Stephen Conner for the decisive goal. It came midway thru the first half and the Miners held on for the Conference win. Missouri S&T’s men’s soccer managed only one shot on goal Sunday – but made that opportunity count as Springfield native Caleb Collier put it into the net to give the Miners a 1-0 victory over No. 20-ranked Drury in Great Lakes Valley Conference play. 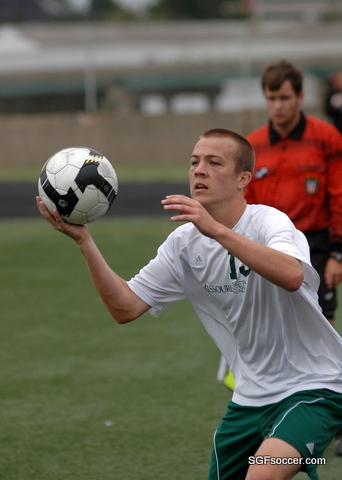 Collier, who played his prep soccer at Kickapoo High School in Springfield, notched the goal at the 29:47 mark when he put a shot from just off the right side of the goal past goalkeeper Stephen Conner. 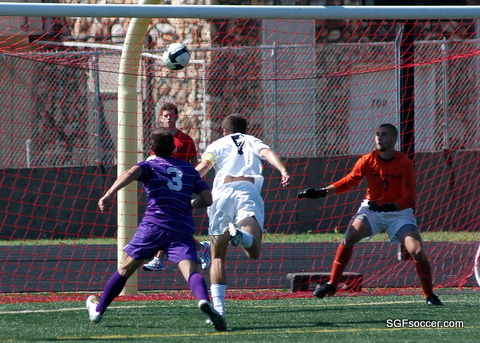 From that point, the Miner defense and goalkeeper Pat McNamee made that goal stand up. Drury ended the contest with a 12-2 advantage in shots overall, but only two of the 12 Panther shots made it to McNamee and he turned both of them away to record his 14th career shutout – one away from the S&T career record held by his older brother Mike. The Panther’s won at home on Friday when David Emnett’s second goal of the game, coming with just 44 seconds left in overtime, lifted Drury to a 3-2 victory over Maryville in Great Lakes Valley Conference men’s soccer action at Harrison Stadium. The Panthers, who spotted Maryville an early 2-0 lead, improved to 5-2 overall and 4-1 in GLVC play. The Saints fell to 1-5 and 1-5. The Miner’s traveled to Kirksville for a game Friday against Truman State. The Bulldogs scored goals in each half of Friday’s game and went on to defeat Missouri S&T 2-0 in men’s soccer action, handing the Miners their second straight loss in the process. The Bulldogs outshot the Miners 22-20 for the game, while the Miners had 10 corner kicks to Truman’s one. 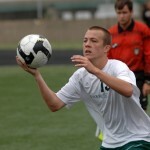 S&T goalkeeper Donny Gesell was credited with 12 saves in goal. Missouri S&T is now 2-2-2. Regional players for Missouri S&T include three sophomores. Caleb Collier (Kickapoo/Springfield SC) has started four games and played in all six, Jervis Atagana (Hickman) has started 3 of 6 games played and Mason Morawitz (Hickman/Springfield SC) who has played in 3 games. The Drury Panther’s moved back into the national rankings again today, in the 20th spot, after falling out of the preseason rankings following their loss to Ashland (OH) at the start of the season. Ashland is now #15 while Northern Kentucky is at #5, making them the top-ranked GLVC men’s program. Bellarmine falls five spots to #23 after their loss to St Joseph’s this past weekend. In the Central region rankings, it’s NKU, Ashland, Drury and Bellarmine with the Top 4 teams advancing to the NCAA playoff. Rockhurst, who fell to Drury in OT on Sunday, are tied for 6th in the regional ranking with fellow GLVC programs Missouri S&T and Quincy. UPDATE – From Facebook comes the news that Drury lost 0-1 to Quincy on a play that saw the Panther’s goalkeeper collide with one of his defenders, with both visiting the hospital post-game. On the play, DU junior All-America goal-keeper Stephen Conner came out of the box to try to thwart Ellison’s open touch and instead collided with DU freshman defender Brendan Langford. Conner suffered a broken nose in the exchange, while Langford suffered a possible leg fracture, according to DU coach Ryan Swan, who was at University Hospital in Columbia with both players late Tuesday night. The Panther’s play Quincy this evening in Columbia, at 7:00 pm at CoMo Park north of I-70 in a makeup of a game canceled due to lightning two weekends ago. Missouri S&T visits Springfield on Sunday, so this week the Panther’s can solidify their position. Senior Blake Wilson, moved from central defense to the midfield this season, scored his first career goal for the Panthers today in the 10th minute to give Drury the early lead and eventual win. 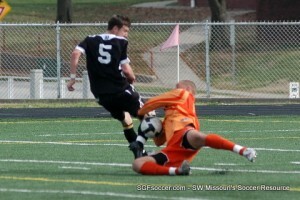 The goal came from a throw-in by senior Alex Palmer (Kickapoo) as Wilson slipped in front of his defender to head the ball just under the crossbar (pictured). The goal came after a the Panther’s weathered an aggressive attacking effort by the Bulldogs as they held on and eventually found their way into the offensive end. Drury scored a second via penalty kick when Micah Whorton scored in the 38th minute after David Emnett drew the foul in the box. Junior keeper Stephen Conner (Glendale) picked up his third shutout of the season and school-record 17th of his career in the contest as the Bulldogs (2-2) outshot the Panthers by a 13-8 count. The Panthers started seniors Danny Collins (Glendale) and Alex Palmer (Kickapoo) and Adam Peterson (Kickapoo) was the first sub and earned significant minutes as well. There were also three freshman starters, with Brendan Langford at center back, Matt Hutchinson (CBC) at left half and Alec Nagel (Jeff City) at forward, the same line up that was featured at Lewis with the injury to Ben Taylor two weeks ago. Freshmen Matt Baker, Michael Yuede and Adam Heiligenstein also saw minutes. 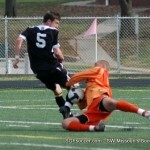 I think sr David Emnett deserves more minutes at forward or attacking midfielder. He’s doing the little things including providing a reliable outlet on throw-ins (critical to holding the ball in tight games like today) and his work rate and passing free up Whorton. It was not an exemplary performance by the boys today as they had difficulty keeping the ball on the ground and finding their teammates. Part of that was due to the quality of the Bulldogs play, as they’ll rue this as one that got away, but the Panther’s were their own worst enemy today. That’s the good news as well as they got the win in difficult circumstances against a quality opponent. Drury is off to a 3-1 start overall after last Sunday’s 1-0 Great Lakes Valley Conference victory at Illinois-Springfield on a goal by senior Peter Higgins in the game’s 48th minute. 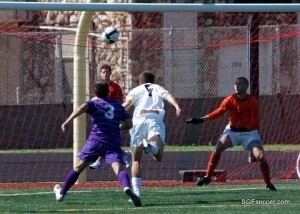 Truman State is now 2-2, having defeated defending NCAA-II national champion Fort Lewis 2-1 last Friday in Kirksville. The Bulldogs also have defeated St. Edward’s 3-0 and lost to William Jewell 3-0. The Panthers and Bulldogs have met each of the last six seasons, with Drury holding a 3-2-1 record in that stretch with three consecutive victories, including a 4-2 decision in Kirksville last season. Friday’s match will feature live audio play-by-play on Stretch Internet, with DU media student John Miller calling the action, as well as live stats. The Panthers will continue the homestand on Sunday when Rockhurst visits Harrison for a noon start in GLVC play. Sunday’s match with Rockhurst will represent the first televised DU soccer match on Mediacom 22, and will be shown on a tape-delay basis throughout next week. This is interesting. Following the release of the NCAA poll placing Lewis University 3rd in the National Poll, the Conference Coaches have chosen them to finish 3rd in the Conference, behind defending champions Drury and their favorite rival, Northern Kentucky. I consider this the more reliable poll as the Coaches are more familiar with each teams strengths, losses due to graduation and recruiting. The nation will have an immediate measure when the Panther’s travel to suburban Chicago to face Lewis in the second game of the season, on Sunday September 5th. If the Panthers win, expect Lewis to drop quickly in the national poll. Here is the press release from the Conference: INDIANAPOLIS – Drury University has been selected as the pre-season favorite to claim the 2010 GLVC Men’s Soccer Championship. In a vote of the GLVC’s 15 head coaches, the Panthers collected 188 total points and eight first-place votes to finish atop the 2010 GLVC Men’s Soccer Preseason Coaches’ Poll. The Panthers (21-2, 13-1 GLVC) edged Northern Kentucky for the top spot in the poll. The Norse (15-6-2, 11-3 GLVC) collected 183 total points and three first-place votes. They were followed by Lewis who placed third in the annual publication. The Flyers (16-3-3,10-3) garnered 168 points and three first-place votes. The final first-place vote was given to Bellarmine. The Knights (11-6-1, 8-5) placed fourth in the poll with 159 total points. UW-Parkside finished fifth in the voting with 142 total points and is followed in the poll by Rockhurst (115 total points), Quincy (112), Missouri S&T (108), Missouri-St. Louis (95), Indianapolis (81), Saint Joseph’s (76), Illinois-Springfield (62), Kentucky Wesleyan (37) and Maryville (28), and Illinois-Springfield (21). 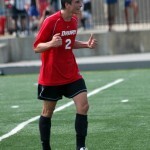 Drury defeated Northern Kentucky in the 2009 GLVC championship match, 1-0, to claim the school’s first men’s soccer title. The Panthers advanced to the NCAA Midwest Regional Final before falling to Lewis, 1-0. 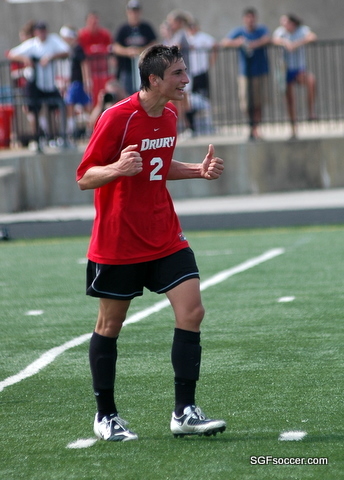 Drury is led by head coach Ryan Swan, the 2009 GLVC Coach of the Year, and last season’s GLVC Defensive Player of the Year Stephen Conner, a junior senior goalkeeper for the Panthers.